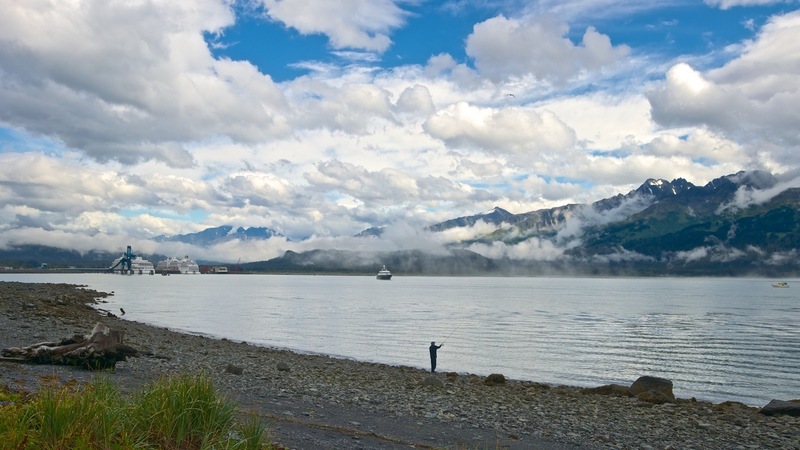 We were in Seward yesterday most of the day and spent the night there in the city campground on Resurrection Bay. This was one of the very few moments when it was not raining or so foggy one could not see 100 feet. We left there this morning after and hour or two of much the same weather. We are now in Soldotna at our favorite Fred Meyer. We did get a few images on the way here and i will get them out in another email. Ressurection Bay at Seward, AK. Two large cruise ships were docked. A very pretty location when it is not so foggy one can not see boats in the bay.